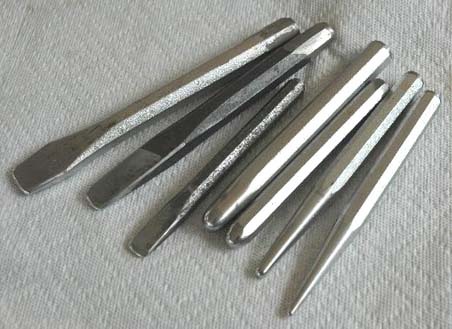 One of the two classes I took last week at the Bead & Button Show was how to make tools from tool steel. Now, for those who only know me through my writing, my characters play with fire (a lot) and do glass and enamel art (as well as more traditional forms), but metal is rarely mentioned. It's there, but implied rather than brought front and center. But I love metal as much as my glasswork and I had wanted to know how to work with tool steel to make what I needed on the fly for a long time. 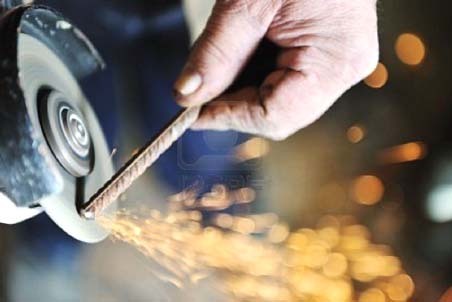 I love seeing the sparks fly when I put tool steel against a grinding wheel! Fun! So I had this wonderful class that gave us a length of tool steel stock, taught us how to cut it into smaller pieces and then use grinding wheels, vertical sanding belt sanders, and polishing discs along with fire (because what in my life can be fun without flame) to make tools. And I loved it. But what was really fun was using them the next day. I used to watch my dad making fancy scroll-work metal gates - there was a lot of shaping and welding going on. He used to shout at me to stop watching the sparks. In the end he let me use his spare welding mask. Whenever he soldered anything the blobs of solder would drip onto the cooker enamel and make all sorts of shapes. I used to prise them off and keep them in my treasure box. He used to shout at me to stop watching the sparks. In the end he let me use his spare welding mask. My stepfather used to get something called arc-eye from welding without using a mask. My dad had one of those full-face welding masks. My dad always wore a full face mask. I would be nowhere near his workshop but he would still shout at me from up the garden - we played at the other end. My dad constantly warned that I would get arc eye but I never did - perhaps because I never looked at the welding for long enough and I was so far away. He seemed to know when we were looking. Solder and brazing is fun. I know how to solder, but not how to arc weld although I've always wanted to learn. I just need some time and some serious fire. I can do this - LOLOL. I can solder but even though I learned the mechanics of welding my dad never actually let me do it. He thought my eyes were too young and could be damaged, even though I wore a full face mask like he did. I know your new experiences will find their way into your stories somehow! :) I'm glad you're having a good time. I'm quite sure they will. If nothing else, fire will - LOL. But I have always felt that because I work with flame, glass and gemstones that I have a unique perspective on Feanor's forge. One of the oldest and most secret of ancient arts is the forge. The Forge. It contains such deeply rooted magic and the tales and myths that rose from it still resonate today. Within the Forge, alchemy occurred and stone was turned into weapons and implements for daily life. How kewl is that? I love working at the forge, but I also weave and spin, so I guess I've got most of your bases covered. I don't do glass blowing, preferring to fuse glass instead. It was a kick. I felt very Cro-Magnon, i.e. ... (wo)man...the tool maker - LOL. Ooh. I would love to learn how to work metal. I would never have guessed that would be part of the curriculum at a Bead and Button Show... or that you'd get to play with fire. It's jewelry making, not blacksmithing, but still a lot of fun. I've been a working jeweler on and off for more than ten years now and I usually take metals courses because I love playing with metal, tools, fire and heat. I would love to learn some ironmongering too, but this was my first time working with steel and it was a lot of fun. That sounds amazing. ♥ Metal-working must be so satisfying.